I have felt many things for the Superior Spider-Man since this series first launched last year: curiosity, frustration, disgust, shock, surprise, joy … pick your adjective. Except sympathy. As much as we are living an era filled with anti-heroes that we have been conditioned to cheer for like Walter White or Tony Soprano, I can’t say I’ve ever been able to transfer those feelings to Spider Ock. Despite enjoying the Superior Spider-Man immensely, I’ve still had a difficult time viewing Otto Octavius as anything but a villain, who used nefarious methods to steal life away from a true hero, Peter Parker. I’m hesitating in saying that I finally got a pang of sympathy for Spider Ock in Superior Spider-Man #28, but Dan Slott’s script certainly has me leaning that way. The proverbial excrement is hitting the fan for Spider Ock in every way that’s conceivable, and there’s still a big part of me that understands that this entire mess that keeps getting messier by the page, is all of byproduct of Otto’s arrogance and hubris. 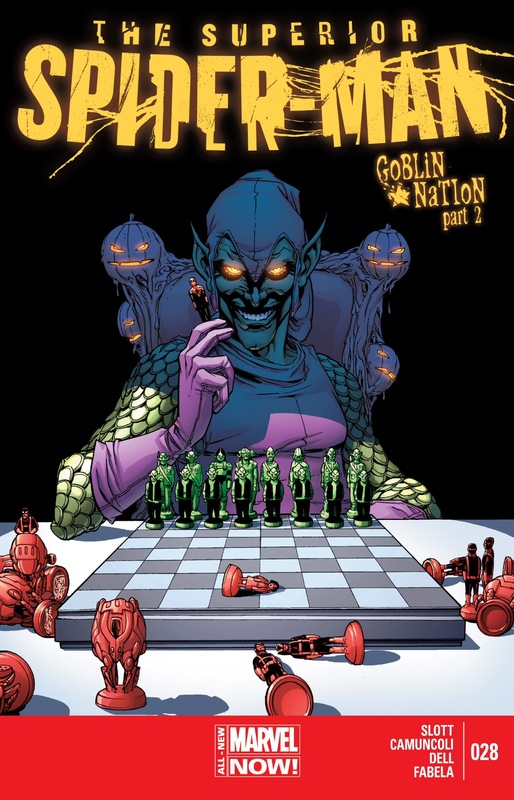 But damn, the Goblin is one evil SOB, and the deck is so firmly stacked against Spider Ock right now, I can’t help but find myself cheering for him, hoping that he can channel a little bit of Peter’s spirit and overcome these seemingly insurmountable odds. There are still some fundamental flaws in Superior #28’s construction that keep me from heaping lavish praise on it. But at the same time, I have to give Slott credit for creating a script that forces me to be emotionally invested in the titular character, whether I want to or not. Over the years, Doctor Octopus has murdered countless people, has threatened to blow up New York City, attempted to marry Aunt May for her inheritance and many, many other evil deeds. And yet my mouth is still agape as the Green Goblin’s army destroys Spider Island II (and even kills Otto’s favorite henchman No. 23), has transformed Carlie Cooper into a hideous monster (named “Monster”), and then abducts Spider Ock’s love, Anna Maria, on the comic’s last page in a scene that’s so ominous, I can’t envision a way this story doesn’t end with yet another woman in a refrigerator. When did the Green Goblin learn the Superior Spider-Man’s identity? Unless my reading comprehension skills have reached an all-time low (I am getting older and more absent-minded) based on the events in Superior #28, I’m assuming that this very critical revelation was made “off camera” so to speak, or perhaps during the mysterious “31 days later” period that transpired between issues #26 and #27. I’m sure that different people feel different things about something like this, but for me, off-screen reveals are a major pet peeve. I’m still a biit bitter by the fact that No Country for Old Men received so many accolades even though (*spoiler alert*) the main character is killed off-screen in unceremonious fashion. My frustration with this storytelling device is enhanced by the fact that for a number of issues, the Goblin has been making such a point about trying to figure out who was under the Spider-Man ask. The character had an inkling that he should know, but he was unable to address that “itch.” Why make such a point of the Goblin’s desire to get this information when he just ends up learning about it in a scene that no one bothered to script or illustrate. Unless of course this is more misdirection – though if that’s the case, the end of Superior #28 with Anna Maria is even more confusing. 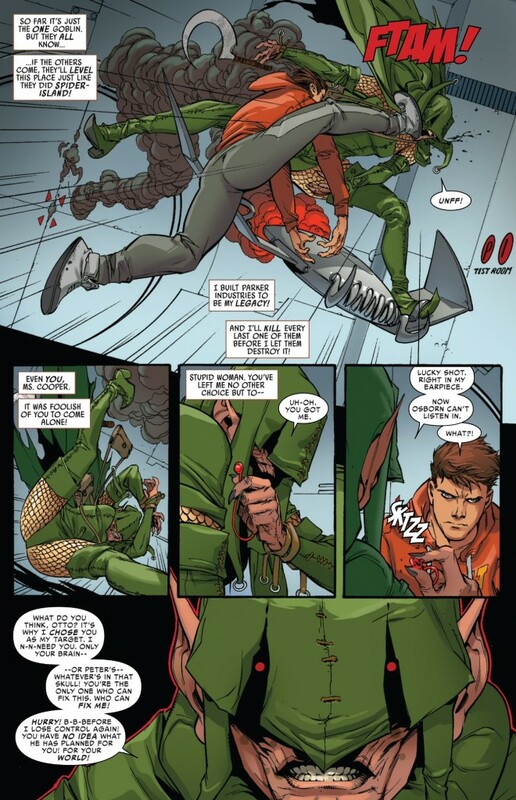 Plus we do get a scene between Carlie and “Peter” that more or less spells out the fact that the Green Goblin knows who Peter is and is gunning for him and everyone he knows. As has been my suspicions for sometime, Carlie, regardless of her “Monster” status, is going to play a critical role in the conclusion of the Superior-era. 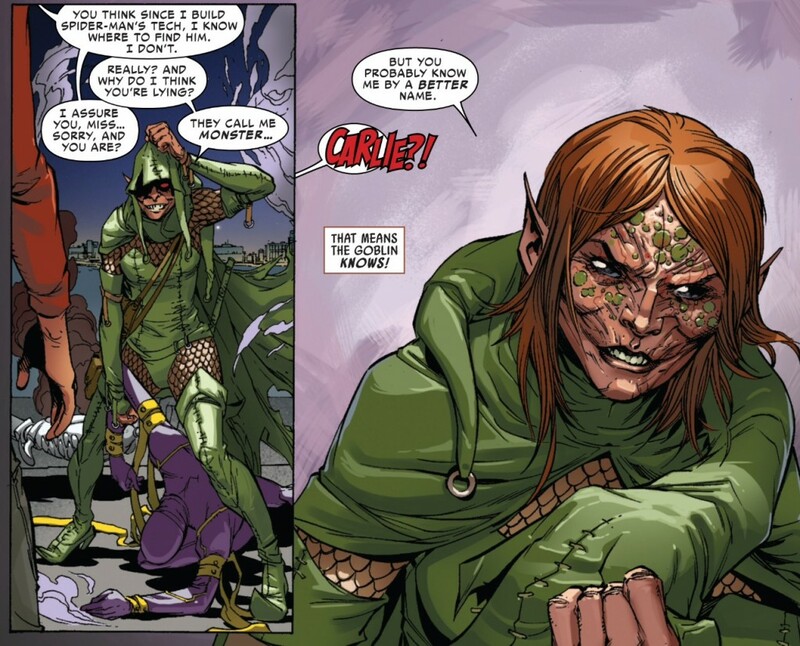 Slott gives us a cake and eat it too moment with Carlie where its confirmed that her transformation into a Menace-like Goboin-villain is a very real thing, and not some kind of mind game she’s playing in order to throw the Green Goblin off her scent. But there is naturally a catch: Carlie’s a Goblin, but she has moments where she’s able to regain control of her old Carlie self. 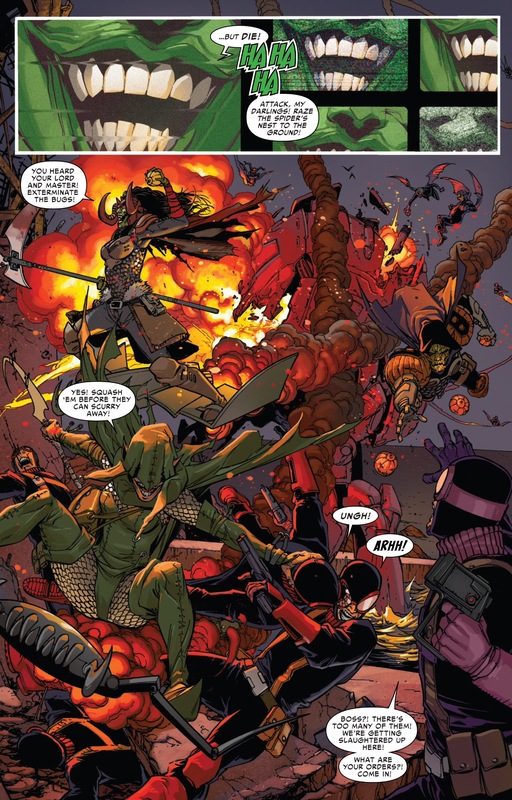 In Superior #28, she regains control long enough to warn “Peter” that the Goblins are going to strike at him any way possible. After “Monster” was introduced in Superior #25, I mentioned that the whole plot twist had left me feeling uncomfortable. Even with the small glimmer of hope Slott attaches to the character during this issue (she asks Otto to access Peter to try and “fix” her), I still question in this day of age in comic books, why putting all the female characters through such extreme circumstances as a result of the failings of the male hero remains the default storyline template for writers. Carlie can be a frustrating character at time, in large part because she was characterized that way by Slott and others, but making her a supervillain – even one who is fighting it – is a very uncomfortable thing for me to process. I also was a little nonplussed by the Mary Jane’s storyline. MJ’s characterization continues to change with every issue, from damsel in distress to assertive and independent and I can’t help but think that the character I’m most familiar with lies somewhere in the middle. 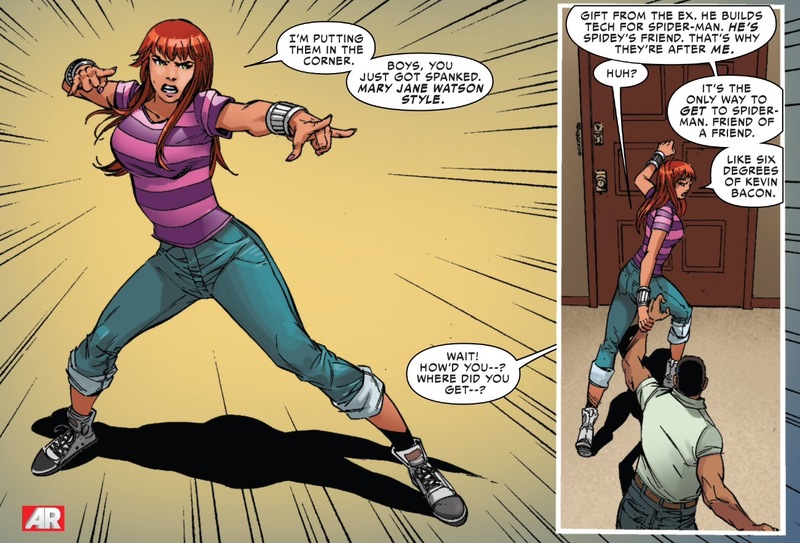 When the Goblin children invade her apartment, MJ’s response – to grab Peter’s web shooters and string them up, aka spank them “Mary Jane Watson style” – comes across as being reckless and out of left field. 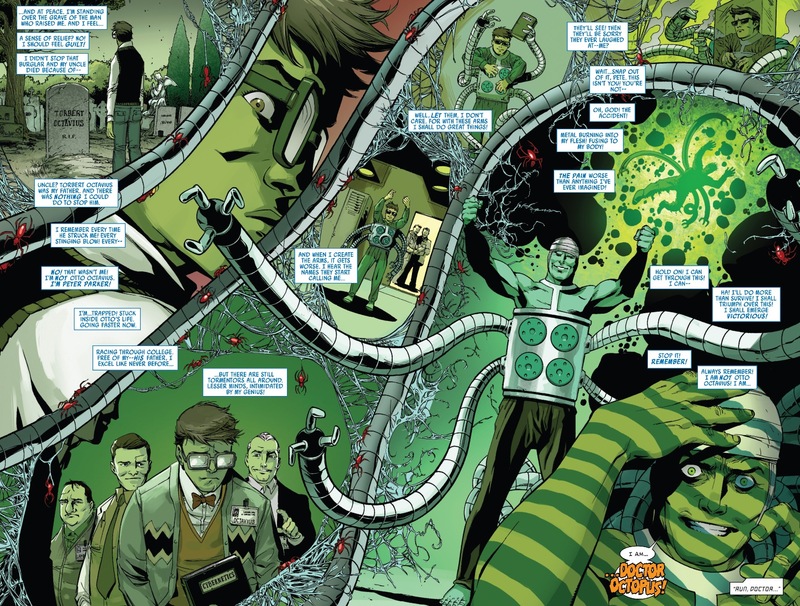 One more thing I especially appreciated during the Astral Peter sequences – and something Superior Spider-Man has consistently done well since its inception – is Camuncoli’s visual interpretation of Doc Ock’s origin from Amazing Spider-Man #3. Seeing these classic scenes with modern aesthetical sensibilities is such a treat for long-time fans of Spider-Man comics. In nearly every instance Superior has shown a flashback scene like this, the current artist is careful to not try and “outshine” the classic artist, paying homage to the works of Steve Ditko, John Romita Sr. et al. This is how you celebrate a comic’s history and successfully merge past and present. Yes, the artwork in the double page spread of Otto’s mindscape was incredible – beautifully evoking Ditko’s panels in ASM #3. Drinking in the silhouette of the explosion, the hand on the forehead (those kooky Ditko hands, so distinctive), gave me a real thrill. For die hard fans who know the early stories, these little touches hit us somewhere deep. You don’t need to know the references, but if you do, it accentuates the the stories beautifully. As Slott takes Spidey into new and interesting territory, I love his nods to the past. Makes me feel like Spidey is in great hands. Regarding your concerns about who knows what: we all know from #27 that the Goblin knows that Otto is pretending to be Spider-Man, which is great. But I don’t think the Goblin knows that Peter Parker is Spider-Man. Yet. We see Spock jumping to this conclusion, but I got the sense that this is just misdirection from Slott. I think the Goblin finding out will be shown on the page, sometime during this final arc, and it will be milked for all it’s worth. 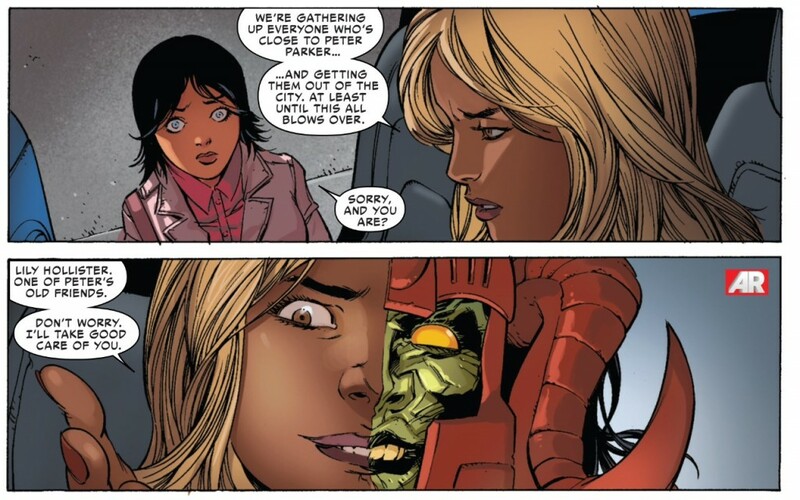 Also, is Liz Allan the Goblin King? Was she setting off Spock’s spidey sense in #17? And is that really Norman’s face on a Spider-Slayer on the final page? And are these just rhetorical questions? I think you might be assuming too much here Dan. In Superior spider-man annual. Ock makes it clear that going after Parker or his loved ones is a line you don’t cross. When this is told to the goblin and his minion asks why take the risk of targeting his friends, the goblin says “Because its tradition.” So if you treat that annual like it counts then there is no issue here, the goblin sent minions to capture all spider-man’s friends including Parker, parker’s family, and his girlfriend to use against Spider-man. In fact if Gobby knew pete was spidey would he really have sent one person to get him? Just like the legendary Tom Defalco tried to tell you, Annuals count. Yeah, I read the Annual and I’ll readily admit as I was writing the post I failed to think of that angle in how the situation was framed here. Beyond that, if the Goblin is indeed Norman, he has used Peter as a way to get to Spider-Man even without knowing his identity (Like in “New Ways to Die”). However, that still leaves me a bit confused why Anna Maria has been targeted as she’s a rather new entry into Peter’s world and I have no idea how the Goblin Army would have even found out about her. Additionally, regardless of the Annual and its counting, I do think it’s worth questioning whether or not Slott is overplaying his hand with the misdirection here. So now on top of the five other mysteries running in this series, we’re not questioning whether or not the Goblin actually knows it’s “Peter” under the mask? It just seems like a few too many balls being juggled here. Regarding Mary Jane I see a smooth character progression from the start of the series. First she and Otto are doing the MJ Peter dance. She attacks the vultures minions without fear, making her seem fearless. Then when Ock rescues her we are given a clue about why she’s so brave, Spidey will always save her. We see she has grown dependent on him, which does make sense he is her best friend, lover, and hero all rolled into one. When he leaves her she pays lip service to Carlie about moving on but clearly she doesn’t, like any on again off again relationship it can be hard to accept when it really ends. When the fire occurs the doors were barred from the outside so it was obviously an attack, and she just waits for Peter as if it doesn’t even occur to her that its a possibility he won’t be there. When he isn’t she starts to move on with Ollie, and then bam Carlie vanishes, venom grabs ock and she calls the Avengers. Finally when the goblin comes at her she takes matters into her own hands. She learned web slinging in spider island so of course she knows how to web up a couple goblins. All this time without Peter to save her she has grown stronger and now she’s gonna save him. but we will see. I’m not really sure the exact time scale but “Peter” and Anna have been together long enough for her to be a regular fixture in his apartment. presumably she has been seen with Pete. I wanna know while carlie has a wird mutant face but Lily, Phil, Norma, and Harry are all totally normal looking. I just got back into spidey during superior but since when does Goblin serum give you a monster face?